There is no station in the highland Zao Onsen area. The nearest train station is Yamagata Station on the Yamagata Shinkansen line. The quickest way to get to Zao Onsen by train from Tokyo is to use the Yamagata Shinansen (bullet train). From Tokyo Station, take the Tsubasa train to Yamagata Station. This journey takes between 2.5 and 3 hours, depending on which train you board. The Yamagata Shinkansen actually uses the tracks of both the Tohoku Shinkansen and the Ou Honsen line - meaning that there is no actual dedicated Shinkansen track between Fukushima Station and Shinjo Station. The section between Tokyo Station and Fukushima Station is on the Tohoku Shinkansen. The section between Fukushima Station and Shinjo Station is the part often referred to as the 'Yamagata Shinkansen' but as it shares tracks with other regular train services it is sometimes known as a 'mini Shinkansen'. From Sendai Station, take the Senzan-sen train line to Yamagata Station. From Yamagata Station, take one of the buses direct to the Zao Onsen Bus Terminal in the village. This journey takes around 45 minutes and (as of 2015) the one-way charge is 1000 yen for adults and 500 yen for children. Many of the hotels and other places to stay in Zao Onsen are quite close to the Bus Terminal, but some will also pick you up from the Bus Terminal on request. Check with local tour and train companies for what tours might be available. 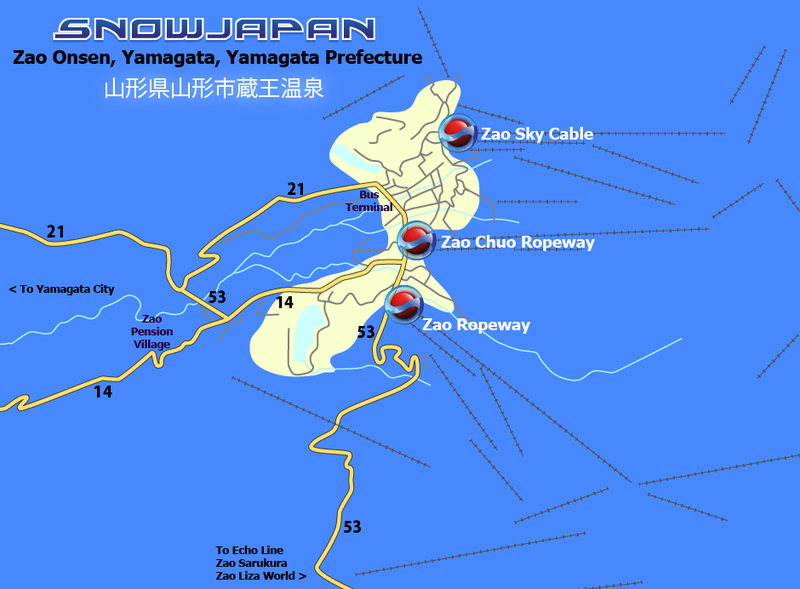 For detailed information on how to get to Zao Onsen by car, please go to this section.